The Turkish president claimed that roughly 5,000 trucks, all loaded with weaponry, were dispatched to northern Syria. 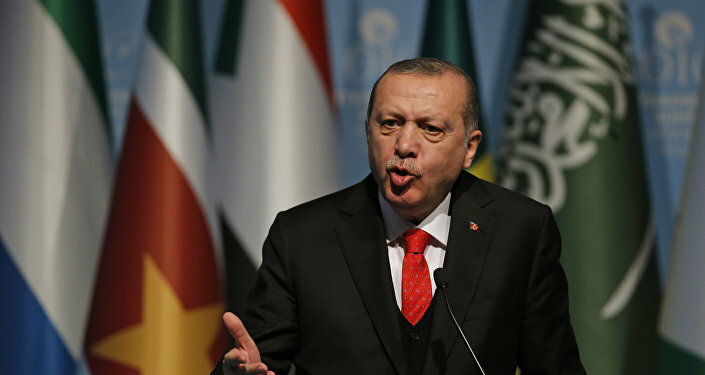 Speaking to the Turkish NTV news channel on Saturday, Turkish President Recep Tayyip Erdogan claimed that the US and its allies are refusing to sell weapons to Ankara while choosing to provide them to Kurdish forces and most notably, for free. "We cannot buy weapons from the US with our money, but unfortunately, the US and coalition forces give these weapons, this ammunition, to terrorist organizations for free,” he said. He reiterated that the threat predominantly originates from what he called “strategic partners." Erdogan went on to say that Washington goes continues to arm militants in Syria, sending in convoys full of weapons there. For instance, according to him, the US sent 5,000 trucks loaded with weapons to northern parts of the embattled country. The US looks upon the Kurdish People’s Protection Units (YPG) as an ally in Syria, and to be more precise, a constituent part of the so-called Syrian Democratic Forces (SDF). The SDF has allegedly been trained, equipped and monitored by the Americans. Last December, US President Donald Trump approved providing $393 million worth of weapons to what Washington calls partners in Syria – the YPG being one of them. Shortly thereafter, the US announced its intention to set up an all-Kurdish battalion comprising about 30,000 people, which was supposed to be deployed along the Turkish border. The move was met with the utmost fury by the Turkish side, and on January 20, Ankara launched a military operation codenamed Olive Branch, tasked with ousting SDF troops from areas in northern Syria near the Turkish border. Ankara recognizes the group to be affiliated with the Kurdistan Workers' Party (PKK), which is considered a terror organization by the US, the EU and Turkey. The latter accused on multiple occasions the SDF of maintaining child soldiers among its ranks and purposefully setting up positions and checkpoints in densely populated districts so that it could allegedly use civilians as human shields.